RHINO RAGS LEADING THE CHARGE! TIDDOX takes great pride in supplying the highest quality RECYCLED WHITE T-SHIRT RAGS to Australian business nationwide, and as such its RHINO RAGS are a popular feature in many of the country's top trade outlets, retail stores, paint resellers and plumbing stores. 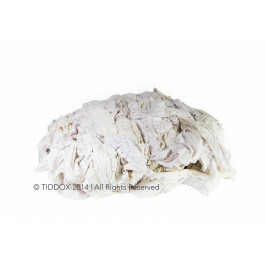 The TIDDOX WHITE RECYCLED T-SHIRT RAGS are environmentally friendly having been sourced from used t-shirts, washed and repacked as rags, thereby saving them from the landfill and reducing dump site waste. The discarded t-shirts are meticulously sifted through separating the white t-shirts from the coloured t-shirt material. Once the usable white t-shirts have been extracted, they are then subjected to strict quality control measures which involves a thorough washing process and a metal detection test. To remove unhygienic contaminants from the discarded textiles, the selected white t-shirts are washed in giant laundromats. Not all suppliers of rags will adopt such measures, which becomes obvious to the end user from the odour when opening the bags. The metal detection process of the white recycled t-shirt rags is to ensure that each rag is appropriate for cleaning and free of foreign materials, such as pins, zips or buttons that may be harmful to the end user and scratch or damage surfaces when wiping. Customers are assured that there will be no scratches or accidents when they use TIDDOX environmentally friendly recycled white rags that are absorbent and safe to use. An interesting fact is that recycled or reclaimed t-shirts are much more absorbent than new cotton t-shirt material. Recycled cotton is much more efficient in drawing in spills that freshly manufactured cotton cloths. White rags in particular are excellent for absorbing solvents, inks and chemicals making them very popular with PAINTERS and PRINTERS. WHITE T-SHIRT fabric is a cotton polyester mix, which makes them strong and the cotton fibres tend to be tightly bound with the polyester which reduces the likelihood of loose fibres, or "lint" remains on the surface after wiping. This is particularly important in applications where a low lint wiping rag is required, such as CAR DETAILERS and certain AUTOMOTIVE wiping tasks, such as polishing windscreens and mirrors, as well as drying and polishing the outer body of the vehicles. Ideally there should be no trace of the rag after use, other than a spotless finish! PRINTERS also rely on low linting rags as unwanted lint can interfere with the printing equipment or cause it to malfunction. Recycled rags should just clean up and leave nothing behind. It is worth noting that the reason for the higher price of white t-shirt rags in the market is because there are fewer white shirt rags than coloured t-shirts. To exacerbate this, the demand for white t-shirt rags is also greater than the demand for coloured t-shirt material as the white colour highlights absorbed dirt, grease, oil, paint, ink, solvents and chemicals. However, because of the volume of rags that we and our partners import each year, which is in excess of 100 containers, we are able to provide competitive pricing on WHITE T-SHIRT RAGS to our customers, and distribution nationwide from our warehouses in each of the major states. This, combined with the quality of product, makes for a value for money offering enjoyed by AUTOMOTIVE , commercial, manufacturing, printing, painting industrial and marine businesses nationwide. TIDDOX WHITE T-SHIRT RAGS ;are available in 10kg bags (white T-shirt) and 1.5kg bags (white cotton) for easy, portable and convenient transport, storage and use. Other related products from TIDDOX 's range of cleaning rags, cloths and wipes include the COLOURED T-SHIRT RAGS, the LOW LINT INDUSTRO WIPES and the SOLVENT RESISTANT WIPES.